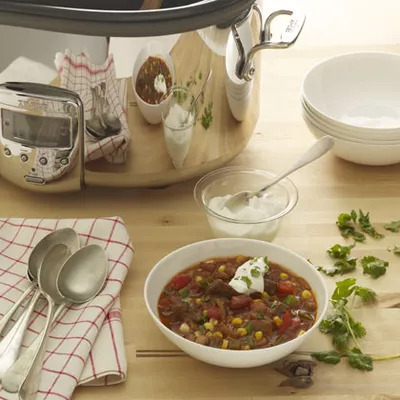 Stay warm and feel satisfied with this smoky chipotle chili recipe. This dish, which is naturally gluten-free, contains only 349 calories and 3g of saturated fat per serving while packing in 23g of protein and 14g of fiber. It's an excellent choice for a healthy Super Bowl Sunday, if you ask us. This winter comfort food features cumin, a delicious spice with numerous health benefits. A serving of cumin contains 15% of your daily value of iron, which is essential for energy and immune system function—both important in the gloomy winter months. Cumin is also known to be good for digestion. The recipe also calls for unsweetened cocoa powder, which not only intensifies the chili's rich flavor, but contains polyphenolic flavonoids which have been associated with decreased blood pressure, improved blood vessel health, and improvement in cholesterol levels.